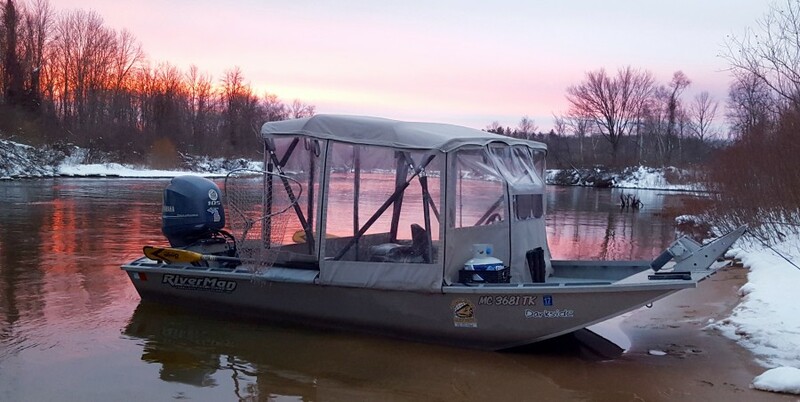 Premier Angling Guide Service is located in Brethren, Michigan in the heart of the fish filled rivers, lakes and streams of the Manistee National Forest. We are just minutes away from all the boat ramps to the Manistee River, Pine River, Bear Creek and Little Manistee and within 35 minutes from the World Famous Pere Marquette River. Here at Premier Angling we are a Fly Fishing & Light Spin Tackle Guide Service that specializes in the pursuit of Steelhead, Salmon, Trout and Smallmouth Bass. Another technique we use is Centerpin Float Fishing for Steelhead and King Salmon. 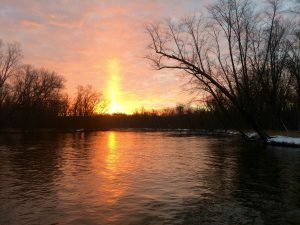 Although we call the Big Manistee River “Home,” we also enjoy guiding and fishing on the Pere Marquette, Pine, Little Manistee and Upper sections of the Manistee River, as well as Bear Creek and the area’s local lakes. Capt. Larry Raney, Owner/Guide of Premier Angling Guide Service, is Licensed and Insured, Federal and State permitted. I have 30 years of experience in the area and 19 years as a Michigan Fishing Guide on all the areas rivers, streams and inland lakes. I also spend the months of July and August guiding at Katmai Lodge in Bristol Bay Alaska. I am truly blessed to make a living as a Full-Time Guide. Not only are we doing what we love, we also enjoy meeting new people and creating lasting friendships with our clients. 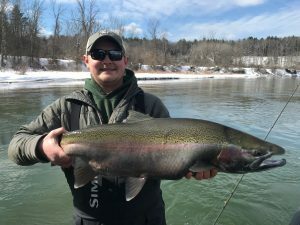 Our goal is to provide you with a quality experience and for you to enjoy the finest fly fishing & spin fishing for, Steelhead, Salmon, Trout and Smallmouth Bass that Northern Michigan has to offer. We want you to experience the fishing trip of a lifetime, one that you will not soon forget. Robert Kerr (RJ), Guide, RJ grew up in Kingsley just Northwest of the Big Manistee. His dad took him on his first steelhead trip when he was six and from then on he was hooked! 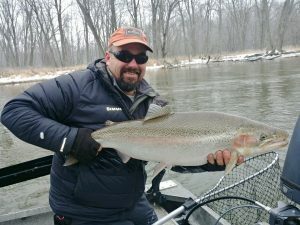 He has dedicated all of his spare time on the waters of the Big Manistee fishing for Steelhead, Salmon and Trout. Although he loves catching these remarkable fish his true passion is taking others out to share the excitement of hooking one of these acrobatic fish.RJ says there is nothing like seeing the joy on others faces when they land a Steelhead, Salmon or Trout. He is very thankful to have this experience and to be able to do what he loves. RJ started with us in the Spring of 2015 and we are glad to have him as part of the team here at Premier Angling Guide Service. Nick Homan, Guide, Nick grew up in Mancelona, Mi where he learned from his grandfather at the age of 13 how to hunt and fish. Ever since then he has had a strong passion for Michigan’s woods and waters. Over the years he has worked hard at perfecting his techniques and officially became a professional guide in the Spring of 2007. He demonstrates a strong passion for fly fishing but is also very experienced when it comes to applying other techniques that we use to catch the fish you are after. When Nick isn’t on the river fishing he enjoys taking clients bird hunting accompanied by his two bird dogs Sage and Ruffy. Nick is bringing his experience and talents to Premier Angling starting in Spring of 2019. Welcome to the team Nick!!! 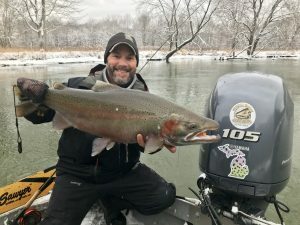 Michigan’s Steelhead, Salmon, Trout & Smallmouth Bass at it’s Finest! !